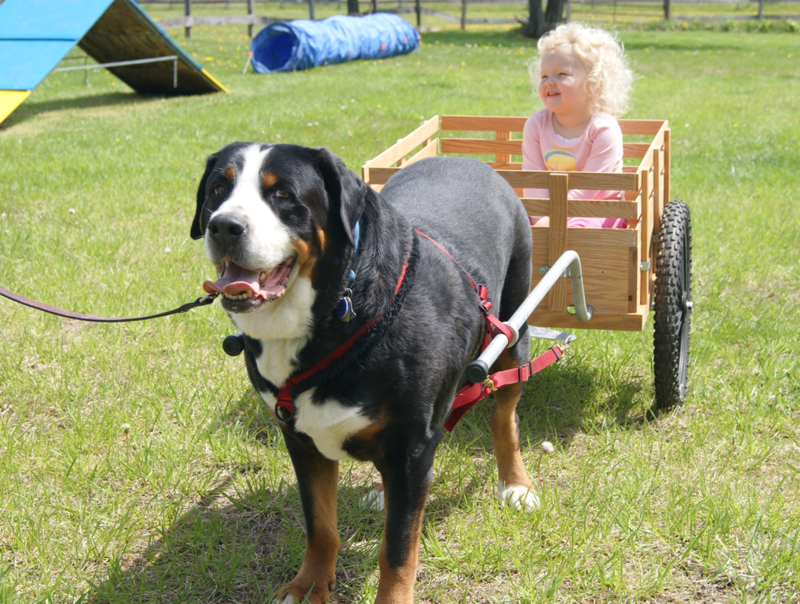 Fun With Your Greater Swiss Mountain Dog! ​The working spirit and versatile background of the Greater Swiss Mountain Dog makes them super partners for many different activities, including drafting (which is pulling a cart or wagon), agility, pack hiking, herding, weight pulling, obedience and rally, therapy dog work, tracking, and conformation (which is showing a dog at dog shows). ​Sometimes referred to as “the poor Swiss farmer’s horse,” the Grosser Schweizer Sennenhund", after helping herd dairy cows in for milking, would be hitched to a wagon or cart for the trip to market, and after the farmer’s long day, give his master a lift back home. Since their arrival in the United States, Swissies have continued this tradition. Today, we celebrate the history of our breed through draft tests designed to mimic the types of obstacles a working Swissy may have had to negotiate while pulling a cart. Standing calm in harness and working steadily, dog and handler demonstrate their proficiency to work as a team to navigate a set course and earn various levels of draft titles. Draft Swissies are also useful in yard work; hauling debris, rocks, sand, etc. And many a Swissy can be seen in local parades across the United States pulling a draft cart. ​Conformation is the judging of breeding stock against the Breed Standard. Dogs are evaluated to determine their value in the breeding programs across the country. Dogs compete first and foremost for their Championship and Grand Championship Titles, but many go on to compete as a Champion for National rankings. ​The Greater Swiss Mountain Dog Club of America (GSMDCA) offers special recognition for dogs ranking in the top 10 in breed and all-breed points, as well as special ranking systems rewarding owner handlers and breeder/owner handlers. 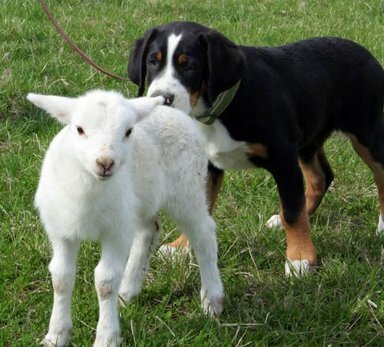 ​Strong herding instinct stems from the historical purpose of the Greater Swiss Mountain Dog. Though bred to function as a draft dog, the Swissy was truly multi-purpose and was also used to manage livestock (primarily dairy cattle) in the mountains of their native Switzerland. 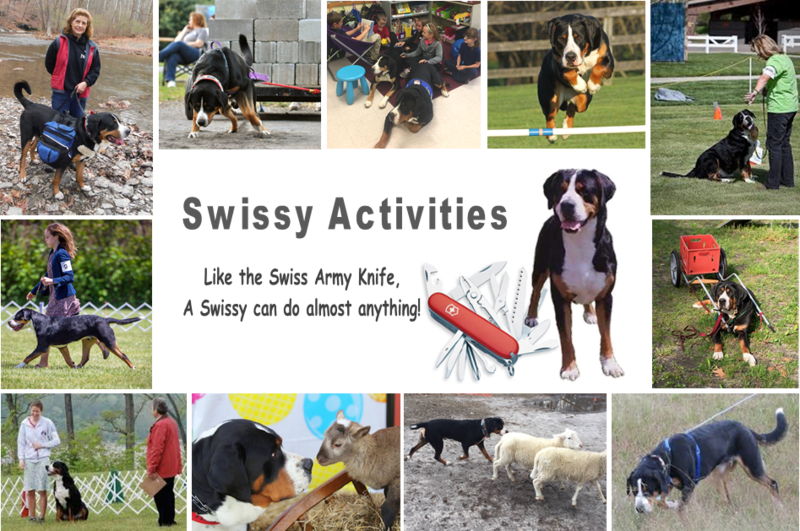 Swissies demonstrate these abilities through herding trials with various types of livestock. ​Dogs and handlers enter obedience trials to demonstrate their ability to complete various tasks amid a high level of distractions. Competitive obedience offers a very stylized manner of skill in performing on lead and off lead control. Dogs are judged on different skills at different levels. Beginning levels evaluate heeling skills, the recall and stationary exercises. Intermediate levels expand to evaluate retrieving and jumping. Advanced levels include off lead heeling and control at a distance without verbal commands, directed retrieving, scent discrimination and directed jumping. Pack Dog hikes offer an opportunity to get back to nature amongst the support and encouragement of other Swissy owners. Hike intensity will vary with terrain, but this is a sport that most Swissies can excel in with just a little effort put towards preparation. Dogs need to be fit and ready to carry 20% of their body weight over a trail; Owners must be fit enough to tag along. The dog carries a sturdy back pack loaded with a 20 or 30 percent of its body weight. Pack weight can only be reduced through the hike by normal consumption of water and snacks carried. Therapy dogs are dogs who go with their owners to volunteer in settings such as schools, hospitals, and nursing homes. From working with a child who is learning to read to visiting a senior in assisted living, therapy dogs and their owners work together as a team to improve the lives of other people. ​Since the 1980's, there have been significant advances in the field of animal assisted therapy and the use of therapy dogs. Organized therapy dog groups provide educational material to volunteers, they screen both volunteers and dogs, and they provide liability insurance for when the dog and handler are volunteering in a therapy setting. ​Tracking demonstrates the ability of the dog to follow a human trail over various terrains and distances. Tracking is a formalized demonstration of search and rescue abilities as dogs follow an aged human trail and signal any objects that may have been dropped along the trail. ​Tracking takes some dedicated training but most dogs can succeed if trained. Few Swissies have ventured into the Tracking venue, but those that have prove their abilities.